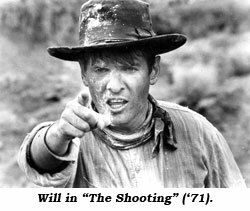 Will Hutchins on "The Shooting". Howdy! Francis Ford Coppola smiled. His teeth gleamed behind his bushy beard and mustache like torch bearers in the Black Forest on their way to Frankenstein’s castle. He slid the contract across his desk. “Sign on the dotted line, Hutch.” I gasped, “I must be dreaming! You really want me for your next super epic, starring Julia Roberts? Er, big or small part?” “There are no small parts, Hutch—only small dressing rooms—sign.” “How much?” “Forty thousand,” he said flatly. I shot back, “I’ll give you twenty thousand and not a penny more.” A gentle tap on my shoulder. I opened my eyes. I always fall asleep in the barber chair. As she bustled out I put aside my tattered issue of TIME featuring an article on why Hitler won’t attack Poland. I flicked silver strands off my apron, leaving only tarnished gold. Doug McClure once told me, “When I was young I had white teeth and yellow hair—now I have yellow teeth and white hair.” Ditto, Doug. A bald gent shuffled in. He stood behind me. For a magic moment we looked at each other in the mirror. He spoke, “We both got ollld!” I spoke, “Don’t move. I want to forget you just the way you are.” He shuffled out, and the barber kept on snippin’. I get a lot of that from my devoted fans. They must feel it’s their mission to point out I’m chronologically challenged. I remind them it’s later than they think. Hey, all you folks—I know! Time marches on—only in my case it’s up to a jog trot, rapidly approaching an all-out sprint. Once in a while a fan says something nice, and it makes my day. Heck, it makes my year. I have a letter from a chap in Toronto, Canada. 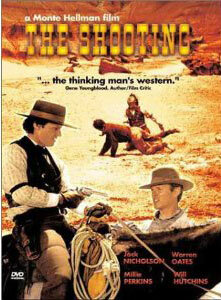 Claims he likes me in Monte Hellman’s cult western, “The Shooting”. Now, a cult western’s a flick your Uncle Silas once told you about, and gol durned if you don’t mean to catch it one o’these daze, God willin’, if the creek don’t rise. Maybe I shouldn’t write too much about “The Shooting”. We made it non-union for about sixty thou. Money under the table from Roger Corman. ‘Twas hand-tooled, not machine cranked. Screen Actor’s Guild warns its members, “No non-union movies—heavy penalties for transgressors.” I’m okay—the statue of limitations and all that—Oops! I mean the statute of limitations. The statue of limitations is the Venus de Milo. One regret. 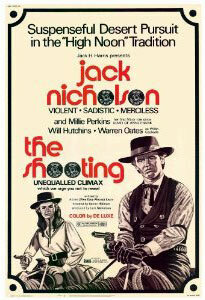 A while ago AMC showed “The Shooting” for the umpteenth time—Lauren Bacall introduced it. Whatta thrill to hear her intone my name in that smoky, sultry voice—Alas! The thrill is gone. What remains is the sad realization I can expect no happy lettuce. No residual check in the mail. My sainted ex and I got hitched in January. ‘Twas now April. Whatta wonderful time for a honeymoon. We flew to a beachy keen cabana in Nassau. I quickly learned the true meaning of Scuba. It’s the way help! sounds under water when you’re drowning. A big hand plucked me out of the Caribbean just in time. Another hand slipped me a soggy telegram. Monte Hellman requested the pleasure of my company for fun and games in Kanab, UT, with some of my La La Land playmates. Antonia Christina and I left on the next windjammer, and—Drat! Drat!